Hackuarium operates on a membership basis at this current time. The monthly membership fee is 20 CHF. It gives access to the lab 24/7. The monthly membership fee is 20 CHF. It gives 24/7 access to the lab. Please ask a member of the board if you want to join as a member. Welcome to the wiki of Hackuarium community. As you might notice quickly, it is a work-in-progress. Cliquez ici pour accéder à la version française de ce wiki. This page was launched during our 1st Ever Hackuarium Wiki Sprint that took place on 7 December 2014. More to come! Scroll down and find out what this is all about! DIYbio (Do-It-Yourself biology) is a movement that wants to free the practice of biological research and innovation from the institutional and industrial laboratories. Pursued both by amateurs and professional biologists, DIYbio is developing low-cost and low-tech solutions to problems identified by the community. The movement is characterised by an extremely diverse set of practices and participants. Some call themselves 'biohackers', in reference to the hacker culture. DIYbio.org and DIYbio.eu are the portals of the international and european communities, respectively. For more information, visit the Wikipedia page dedicated to DIYbio. Hackuarium is a not-for-profit association aiming at democratizing science through public engagement. Its members are people from a variety of background who are passionate about tinkering with biology in particular, and science in general. They are interested in open and participatory biology, outside traditional institutions. We want to promote interdisciplinary research and innovation, with minimal costs (low-cost), simple and accessible technologies (low-tech) and open source philosophy. We also rely on upcycling material from institutions and industry from western Switzerland. Our projects are initiated and carried out by scientists as well as citizens from a variety of background. Some are engineers, architects, designers, IT and computer scientists or retired professionals, but others have no scientific education. Our laboratory in Renens is open to anyone sharing the values of the association and who is dedicated to follow DIYbio Europe ethical guidelines. We are active within UniverCité, an innovation hub opened in May 2014. Renens is a hopping hub - and our members reflect the diversity that is in and around Lausanne/Renens. Check us out, and find out what makes Hackuarium a good mix. The Agenda of the last board meeting can be found here. All events are open to anyone, including non-members. 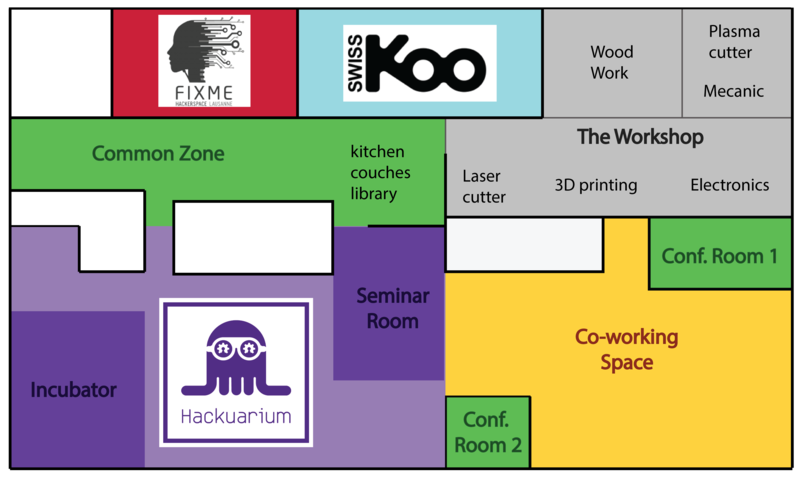 Hackuarium is one of the association active at UniverCité, an innovation space under construction since May 2014 in the IRL building in Renens. We have documented our working environment as it has evolved. As of December 2015, UniverCité regroups a laboratory, a workshop and co-working space. Every Wednesday, 19:00-23:00 #OpenHackuarium: our lab and space are open to the public. Get in touch! 2016.06.14 Tuesday SAVE THE DATE Opendata.ch/2016 Conference, Casino de Montbenon, Lausanne. 2016.03.04 Friday 19:30-22:30 Visite of Hackuarium by participants of the GOSH! Open Science Hardware meetup. 2016.02.12 Friday 9:00-11:00: The Living Instruments project will be featured as part of the official Lift Conference program. 2016.02.10 Wednesday 19:30-21:00: School trip to the music venue le Bourg for an Openhackuarium vol. 84 special music featuring the Living Instruments project. 2016.02.03 Wednesday 19:30-21:00 Participants to the Biodesign.cc Winterschool visit Openhackuarium vol. 83. 2016.01.20 Wednesday 19:30-20:30: General Assembly of the Hackuarium association. Please come, as a member, or as a friend! 2015.12.09 Wednesday 19:30-21:00: Openhackuarium vol. 75 with a presentation of the project beMap. 2015.12.02 Wednesday 19:30-21:00: Openhackuarium vol. 74 with presentations about open source projects in protein science and more! 2015.11.28 Saturday 9:30-15:30: The real Beer DNA workshop Sign-up! Limited space available. 2015.08.26 Wednesday 19:30-20:30: #OpenHackuarium vol. 60: Do we need Lac Léman Science Hackathon? 2015.04.22 Wednesday 19:30-20:30: General Assembly of Hackuarium association. 2014.09.24 Conference by Nicolas Nova, co-fondateur du Near Future Laboratory et enseignant à la HEAD, Genève. Here, you will find the projects going on in the Hackuarium. Following this link you will find a general plan of Hackuarium. 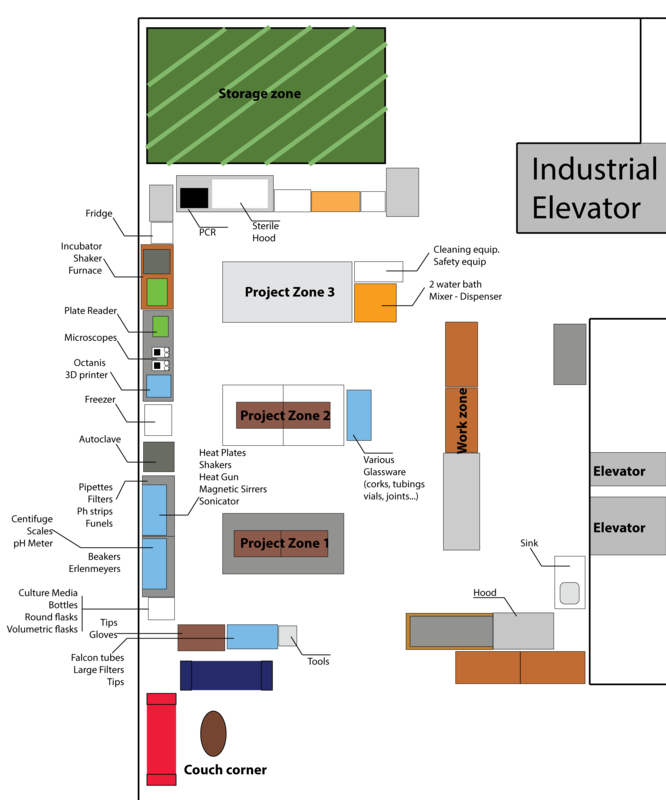 Following this link, you will find the plan of Hackuarium with the position of equipment. This page describe the code of conduct for Hackuarium members. A description of the different ways of carrying out the protocol. Ideally there should be a description of a commercial kit and a DIY kit. Information specific to Hackuarium and where to find the components, tools and reagents. This page describes all the instruments available at Hackuarium (work in progress..), their location and how to use them. This document contains all the instruments and tools we need. If you happen to have a piece of equipment we are (or may be) looking for, contact us! Consumables can be purchased from Huber Lab. Swiss-based Smiples has a very extensive listing of second hand laboratory and technical items. These can be bought from their online shop or from Ricardo.